like a mask of light. I’m not really sure this satisfies the dVerse prompt to write a letter, but I immediately thought of the stitching and Photoshop layering I had done using some childhood photos, trying to make a composite of is and was. It’s been a while, friends, and I’ve missed WordPress. Luckily for me Kerfe pushes me mercilessly and I promised I would post today. “Painting is good for the soul”, Kerfe says, and you know what? She’s right. The last few months have been stressful as my husband closed his private medical practice and joined a group. They hired me also. We have been putting a lot of energy into this endeavor and I haven’t picked up a paintbrush. In thinking about content I realize that I really like to paint people, either from old photos or from photos taken of faces I like. I’m going to concentrate on that for a bit. Not sure if I’ll post ever day but will try for a few times a week. This venue is wonderful for artists and we have made many friends here. Thank you for your patience! Not sure if we’re still doing selfie day on the 25th of the month, but here’s a quick sketch. This is for my “100 self portrait” series, except it’s definitely not the final version. There will be changes and additions…stay tuned. At one point Dumas gave in to her daughter Helena’s desire to draw and paint on top of her mother’s paintings. There were some very interesting results! My daughter Caroline gamely agreed to work on top of the painting I made of my 4 0r 5ish self, and I like her more subtle but colorful choices, above on the left. Of course Helena was 6 at the time, and Caroline is 21, but then I’m a lot older than Dumas was when she did her originals, so I think it balances out. 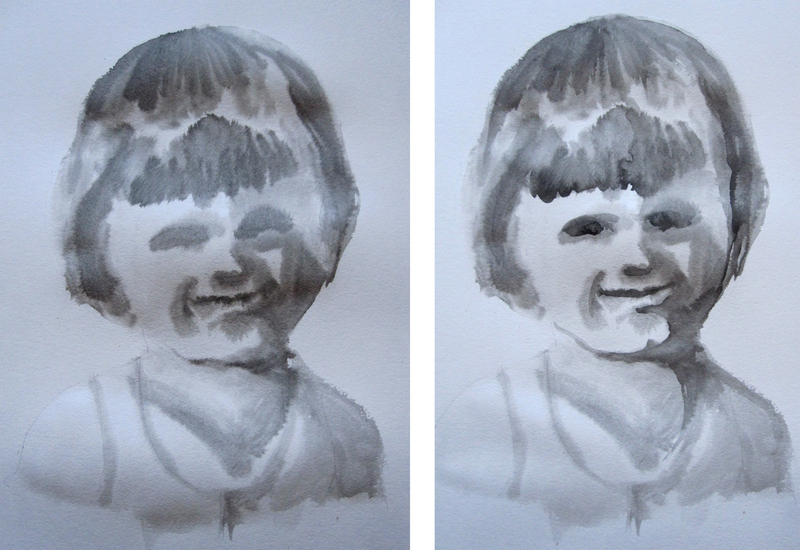 Here is the process for the painting before being colored: wet wash (left) and with added detailing. And then I did a painting from a photo of Caroline at around the same age. 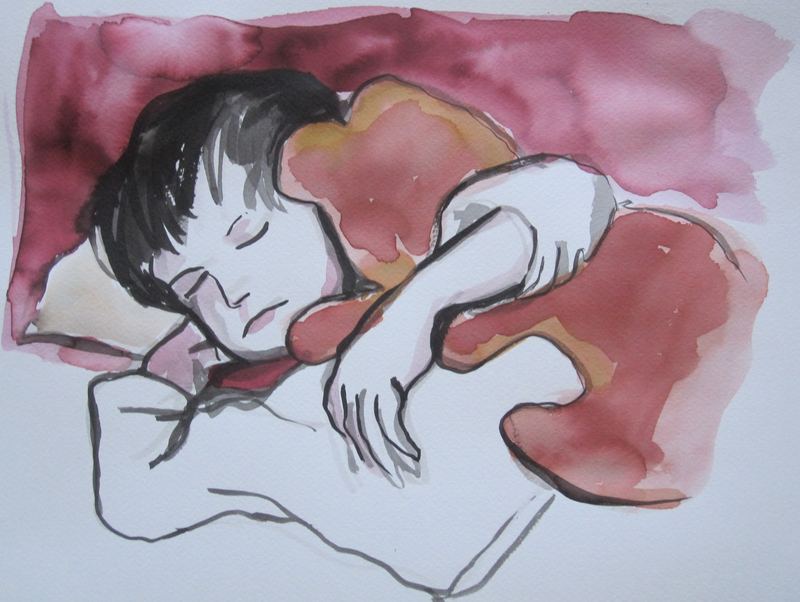 I overworked it a bit, but I think it captures a spark of the child she was. You can see all of the 100 Self Portrait series so far here. Based on a childhood photo I have always loved. I’m not totally satisfied with either attempt, although I learned from doing both. 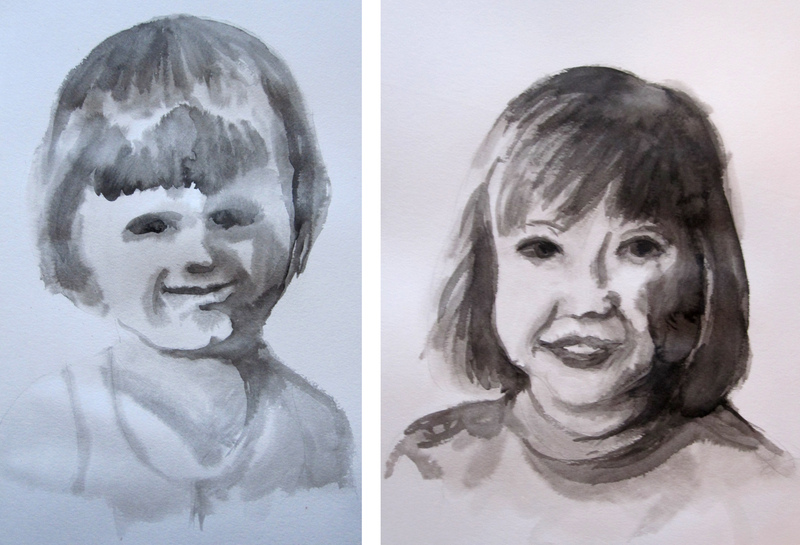 The one on the left was done without any pre-sketching, in a loose and quick way. 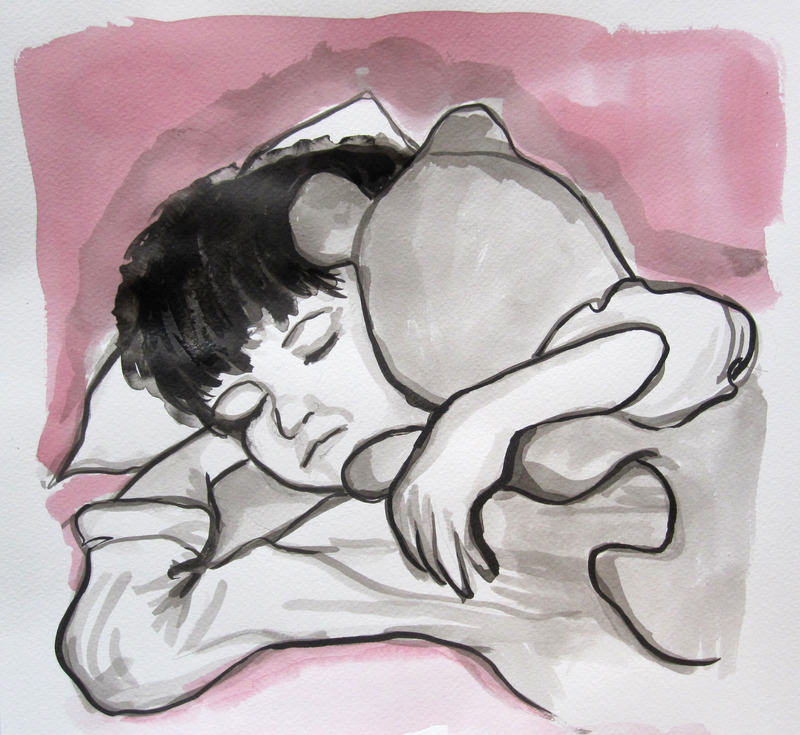 It doesn’t look like me, but my chief dissatisfaction is that I colored in the bear. Maybe if I also colored in the pajamas it would work better. I’m still thinking about that. 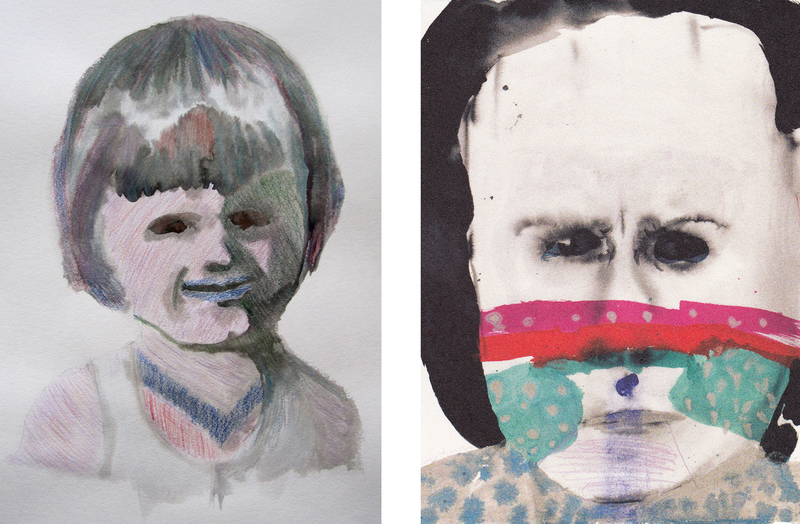 The one on the right was sketched out in pencil first, and I carefully painted layers of grey. It looks more like me, but less like a child I think. And I got too heavy on the hair. But the coloring is more in the spirit of Dumas’ painting. Dumas is a good exercise for me, because I’m still uncomfortable with watercolor. The only way to get better is to keep painting. You can see the whole “100 self portraits” series (so far) here.